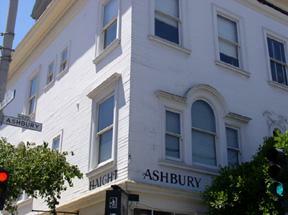 Haight Ashbury is the most famous intersection in San Francisco. Named for Henry Huntley Haight, the governor of California in 1870s, the area is best known as for the 1960s "psychedelic" culture that congregated there is the 2-8 years preceding the 1968 "Summer of Love." Today, the "Haight", as it is called locally is a charming neighborhood of restored Victorian homes, eclectic bookstores and second-hand shops, and ethnic and vegetarian restaurants. The neighborhood has become somewhat gentrified, but a glitter of its "counter-culture" past still lingers. Originally a series of small, privately-owned farms, Haight Ashbury developed into a neighborhood in the late 1880s, when a cable car line was completed to link Market Street with nearby Golden Gate Park. Many of the large Victorian homes, built in that era, still survive, the "Haight" being one of the few neighborhoods not leveled by the 1906 earthquake and subsequent fires. The area was one of the hardest hit by the Depression of the early 1930s and many of the gracious homes were divided into apartments and boarding houses. By the 1950s, lack of maintenance had taken its toll on the neighborhood, and more than a few of the large Victorian mansions were condemned. The cheap housing and Victorian roots attracted the poets and writers of the "Beat" generation on the 1950s, which grew into the "Hippie" culture of the 1960s. Performers, such as "Jefferson Airplane", the "Grateful Dead", Janis Joplin, and the "Mamas and the Papas" made their home there and immortalized (and romantized) the "Haight" in their music. In truth, the area, during the 1960s, was little more than a slum, and after the "hippies" left in the 1970s, many of the homes were torn down and storefronts boarded up. The 1980s saw increased interest in Haight Asbury, spurred partly by increasing housing prices in many other parts of the city. Boarded up shops found new tenants and the large classic homes found young affulent buyers, willing to restore them to their former grandeur. Today, the Haight is a thriving residential and commerical area -- as well as a major tourist attraction. A number of the spacious Victorian structures now house bed and breakfasts, restaurants, and quirky boutiques. Although some critics have groused about commercial stores, such as the Gap and Ben and Jerry's ice cream, coming to the area, the area still remains a Bohemian and slightly off-beat ambiance. Independent bookstores, vegetarian restaurants and food stores, and homemade craft stores still abound, albeit now with a fresh coat of paint. The "Haight" is easily reached via bus or a short taxi from Union Square and other parts of the Bay area. The neighborhood is best explored on foot, with the majority of the shopping on Haight Avenue in the two blocks surrounding the intersection of Ashbury. Other sights in the area include the "Grateful Dead" house, at 710 Ashbury, where the famous counter culture rock group lived during the 1960s, and the Sacred Space Healing Center, a holistic healing and yoga center. The second Sunday of June each year, the neighborhood comes alive with the Haight Steet Fair, a day-long celebration, featuring a number of live bands, tasty food from local restaurants, and local craft vendors. Those wanting to explore the neighborhood in more depth may wish to stay at one of the several bed and breakfast inns, such as the Red Victorian Inn on Haight Avenue.